Kenya: Cyrq Energy Plans 330 MW Geothermal Power Plant in Suswa - Chief executive Nicholas Goodman said applications for approval had been sent out to regulatory agencies in Kenya after feasibility studies conducted at the site confirmed availability of adequate thermal energy to power the project. Portugal: Tender to Drill New Wells at Azores Geothermal Power Plants to Open in January - EDA Renováveis, S.A. announces the release of a drilling tender during January 2019 to award the provision of drilling services for geothermal wells in Ribeira Grande Geothermal Field (São Miguel Island) and Pico Alto Geothermal Field (Terceira Island), Azores, Portugal. Ethiopia: Contract Signed to Develop 50 MW Tulu Moye Geothermal Power Plant - M-V, a company jointly owned by Mannvit and Verkís for cooperation on international projects, has recently signed a consulting agreement with Tulu Moye Geothermal (TMGO) for Owner’s Engineer services concerning the development of a geothermal power plant in Tulu Moye, Ethiopia. USA, California: Company Announces Plans to Build Four Geothermal Power Plants in Imperial Valley - Hy-Power Industries Inc. of Eureka, California, announced this week that it has acquired 1,317 acres in the Salton Sea area for the development of four geothermal energy plants. Montserrat: More Funding Made Available for Geothermal Power Plant Project - The United Kingdom Department for International Development (DFID) has agreed to fund the next phase in the development of a geothermal power plant on Montserrat. USA, California: Workshop on Lithium Recovery from Geothermal Brine - Thursday, November 15, 2018, 1-5 p.m., California Energy Commission, Sacramento, California. Lead Commissioner David Hochschild and California Energy Commission staff will seek input from stakeholders including developers of lithium recovery technologies, lithium marketers, geothermal facility operators, investors, local governments, and state and federal agencies involved in lithium recovery from geothermal brine. Honduras: Ormat Receives OPIC Loan for 35 MW Platanares Geothermal Power Plant - Following the closing, Ormat received a disbursement of $114.7 million representing the full amount of Tranche I of the OPIC non-recourse project finance loan that will carry a fixed interest rate of 7.02% per annum with a maturity of approximately 14 years. Africa: Seventh African Geothermal Conference Opens in Rwanda - African countries should exploit their geothermal energy potential in order to cater for the growing demand of electricity, which is partly driven by the continent’s sustained robust growth, according to industry experts. Europe: Feedback on Draft Strategic Research and Innovation Agenda for Deep Geothermal Open Until November 21 - The Strategic Research and Innovation Agenda identifies future research needs and priorities for the deep geothermal sector and it will lay the basis for upcoming calls of European and National programmes as the next Horizon Europe programme. The contribution of the geothermal sector is therefore essential. Netherlands: Progress in Realising a Geothermal Well on TU Delft Campus - The well will supply campus buildings with heat. In the future further research could be done on extending the heat grid further. Indonesia: Geothermal Power Plants in West Java Produce 1,194 MW - “We have abundant potential geothermal energy in West Java compared to other regions. We have seven geothermal power plants in West Java,” she said, adding that the power plants were located in Kamojang, Salak, Darajat, Wayang Windu, Patuha, Karaha and Cibuni. 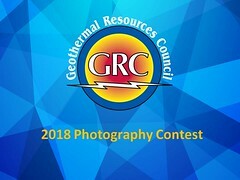 Become a Member of the Geothermal Resources Council - Support your geothermal energy association! Get your geothermal energy news delivered to your email inbox. Subscribe to Global Geothermal News and receive an email summary of the day's news, every day.